Heavy rain and sunshine has given the garden yet another boost – bringing a splash of colour and lush green leaves. The self-sown Common Garden Poppy ‘Papaver somniferum’ plants have come into bloom – their grey-green rubbery foliage standing in contrast against the soft green leaves of the nearby Foxgloves. 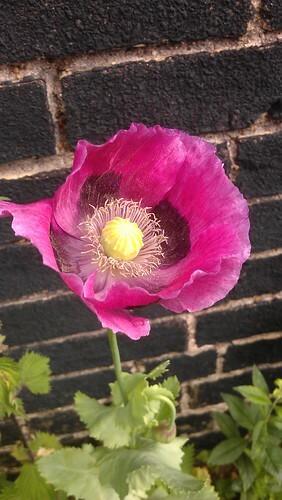 One of the self-sown Common Garden Poppy plants. 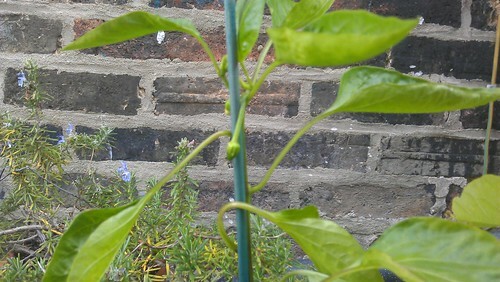 Meanwhile, both of the Pepper (Sweet) ‘Friggitello’ plants that I sowed months ago, and have carefully nurtured on windowsills, are now beginning to show signs of producing fruit after I had planted them out initially in the wicker basket, but then moved them to their own pots after they showed signs of not liking the position. Both plants are showing signs of producing fruits. About 4 days ago, I also sowed some Parsley ‘Laura’ seeds, which like the Pepper (Sweet) ‘Frigitello’, I was given by CBM. This variety is a flat-leaved type which I would use in salads. 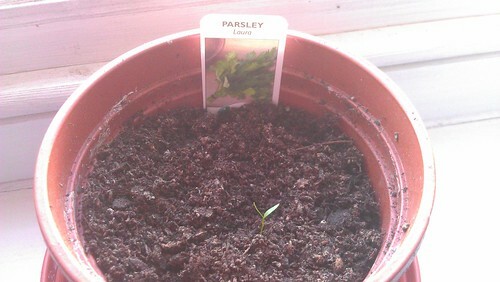 I already have some curled parsley. So far, one of the seeds have germinated, although I am hopeful that more will soon follow. Elsewhere in the garden, white Campanula (persicifolia, i think!) 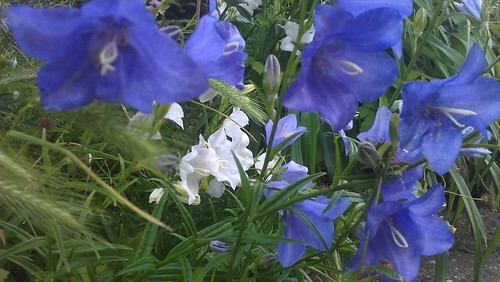 have emerged – taking a minority amongst the many blue ones which were also earlier to flower, and the snails seem to have finally gotten the message after my regular early evening ‘meet and greet’ sessions.